New Brunswick, Nova Scotia, Newfoundland, and Prince Edward Id. 1 : 3260000 Colton, G.W. New Brunswick, Nova Scotia, Newfoundland. and Prince Edward Id. 1 : 3294720 Johnson, A.J. New Brunswick, Nova Scotia and Prince Edward Island. 1 : 2700000 Colton, G.W. New Brunswick, Nova Scotia, Newfoundland. And Prince Edward Island. 1 : 3300000 Colton, G.W. Newfoundland, Nova Scotia, New Brunswick, Cape Breton and Prince Edward Islands. 1 : 2759000 Schonberg & Co.
Newfoundland, New Brunswick, Nova Scotia, Cape Breton & Prince Edward Is. New Brunswick and Nova Scotia. 1 : 2300000 Johnson, A.J. British North America. Sheet I, East. 1 : 2407680 Fullarton, A. & Co.
1 : 2065500 Johnston, W. & A.K. 1 : 1550000 Colton, G.W. New Brunswick, Nova Scotia, Newfoundland, and Prince Edward Island. New Brunswick, Nova Scotia, Newfoundland. Prince Edward Island. 1 : 3219000 Johnson, A.J. New Found Land, St. Laurence Bay, Acadia, New Scotland. 1 : 3484800 Colton, G.W. 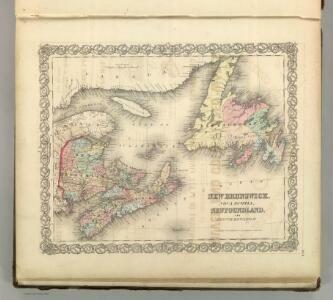 1 : 2500000 John Bartholomew & Co.
Quebec, New Brunswick, Nova Scotia, Prince Edward Id., Newfoundland. 1 : 4300000 Tallis, J. & F.
County map of Nova Scotia, New Brunswick, Cape Breton, and Prince Edward's Islands; City and harbor of Halifax [inset].